"Once more into the fray. Into the last good fight I'll ever know." At a pace just shy of a card a month, NVIDIA has been launching the GeForce 600 series part by part for over the last half year now. What started with the GeForce GTX 680 in March and most recently saw the launch of the GeForce GTX 660 will finally be coming to an end today with the 8th and what is likely the final retail GeForce 600 series card, the GeForce GTX 650 Ti. Last month we saw the introduction of NVIDIA’s 3rd Kepler GPU, GK106, which takes its place between the high-end GK104 and NVIDIA’s low-end/mobile gem, GK107. At the time NVIDIA launched just a single GK106 card, the GTX 660, but of course NVIDIA never launches just one product based on a GPU – if nothing else the economics of semiconductor manufacturing dictate a need for binning, and by extension products to attach to those bins. So it should come as no great surprise that NVIDIA has one more desktop GK106 card, and that card is the GeForce GTX 650 Ti. The GTX 650 Ti is the aptly named successor to 2011’s GeForce GTX 550 Ti, and will occupy the same $150 price point that the GTX 550 Ti launched into. It will sit between the GTX 660 and the recently launched GTX 650, and despite the much closer similarities to the GTX 660 NVIDIA is placing the card into their GTX 650 family and pitching it as a higher performance alternative to the GTX 650. With that in mind, what exactly does NVIDIA’s final desktop consumer launch of 2012 bring to the table? Let’s find out. Coming from the GTX 660 and its fully enabled GK106 GPU, NVIDIA has cut several features and functional units in order to bring the GTX 650 Ti down to their desired TDP and price. As is customary for lower tier parts, GTX 650 Ti ships with a binned GK106 GPU with some functional units disabled, where it unfortunately takes a big hit. For the GTX 650 Ti NVIDIA has opted to disable both SMXes and ROP/L2/memory clusters, with a greater emphasis on the latter. On the shader side of the equation NVIDIA is disabling just a single SMX, giving GTX 650 Ti 768 CUDA cores and 64 texture units. On the ROP/L2/memory side of things however NVIDIA is disabling one of GK106’s three clusters (the minimum granularity for such a change), so coming from the GTX 660 the GTX 650 Ti will have much less memory bandwith and ROP throughput than its older sibling. Taking a look at clockspeeds, along with the reduction in functional units there has also been a reduction in clockspeeds across the board. The GTX 650 Ti will ship at 925MHz, 65MHz lower than the GTX 660 Ti. Furthermore NVIDIA has decided to limit GPU boost functionality to the GTX 660 and higher families, so the GTX 650 Ti will actually run at 925MHz and no higher. The lack of a boost clock means the effective difference is closer to 100MHz. On the other hand the lack of min-maxing here by NVIDIA will have some good ramifications for overclocking, as we’ll see. Meanwhile the memory clock will be at 5.4GHz, which at only 600MHz below NVIDIA’s standards-bearer Kepler memory clock of 6GHz is not nearly as big as the loss of memory bandwidth from the memory bus width reduction. Overall this gives the GTX 650 Ti approximately 72% of the shading/texturing performance, 60% of the ROP throughput, and 60% of the memory bandwidth of the GTX 660. Meanwhile compared to the GTX 650 the GTX 650 Ti has 175% of shading/texturing performance, 108% of the memory bandwidth, and 87% of the ROP throughput of its smaller predecessor. For what little tradition there is, NVIDIA’s x50 parts are traditionally geared towards 1680x1050/1600x900 resolutions. And while NVIDIA is trying to stretch that definition due to the popularity of 1920x1080 monitors, the loss of the ROP/memory cluster all but closes the door on the GTX 650 Ti’s 1080p ambitions. The GTX 650 Ti will be for all intents and purposes NVIDIA’s fastest sub-1080p Kepler card. Moving on, it was interesting to find out that NVIDIA is not going to be disabling SMXes for the GTX 650 Ti in a straightforward manner. Because of GK106’s asymmetrical design and the pigeonhole principle – 5 SMXes spread over 3 GPCs – NVIDIA is going to be shipping GTX 650 Ti certified GPUs with both 2 GPCs and 3 GPCs, depending on which GPC houses the defective SMX that NVIDIA will be disabling. To the best of our knowledge this is the first time NVIDIA has done something like this, particularly since Fermi cards had far more SMs per GPC. 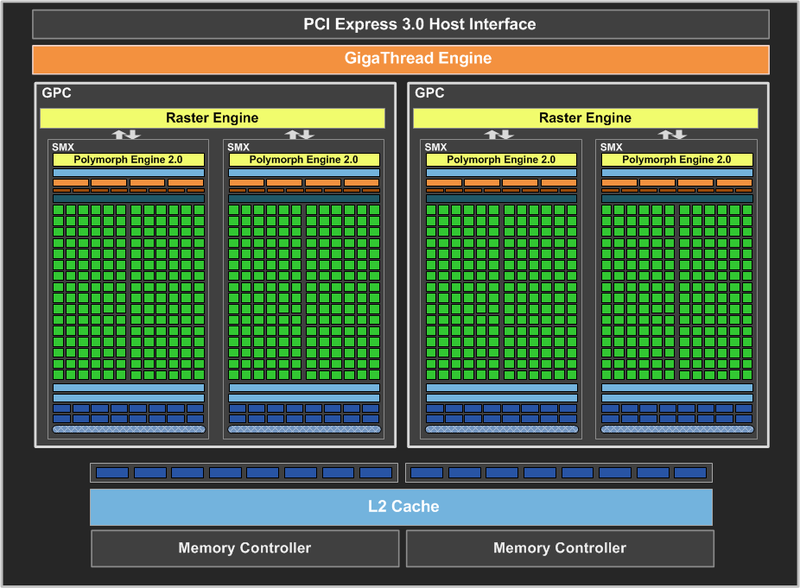 Despite the fact that 3 GPC versions of the GTX 650 Ti should technically have a performance advantage due to the extra Raster Engine, NVIDIA tells us that the performance is virtually identical to the 2 GPC version. Ultimately since GTX 650 Ti is going to be ROP bottlenecked anyhow – and hence lacking the ROP throughput to take advantage of that 3rd Raster Engine – the difference should be just as insignificant as NVIDIA claims. Meanwhile when it comes to power consumption the GTX 650 Ti is being given a TDP of 110W, some 30W lower than the GTX 660. Even compared to the GTX 550 Ti this is still a hair lower (116W vs. 110W), while the gap between the GTX 650 Ti and GTX 650 will be 34W. Idle power consumption on the other hand will be virtually unchanged, with the GTX 650 Ti maintaining the GTX 660’s 5W standard. As NVIDIA’s final consumer desktop GeForce 600 card for the year, NVIDIA is setting the MSRP of the 1GB card at $150, between the $109 GTX 650 and the $229 GTX 660. This is another virtual launch, with partners going ahead with their own designs from the start. NVIDIA’s reference design will not be directly sold, but most of the retail boards will be very similar to NVIDIA’s reference card anyhow, implementing a single-fan open air cooler like NVIDIA’s. PCBs should also be similar; 2 of the 3 retail cards we’re looking at use the reference PCB, which on a side note is identical to the GTX 650 reference PCB as GTX 650 Ti and GTX 650 are pin compatible. Meanwhile similar to the GTX 660 Ti launch, partners will be going ahead with a mix of memory capacities, with many partners offering both 1GB and 2GB cards. At launch the GTX 650 Ti will be facing competition from both last-generation GeForce cards and current-generation Radeon cards. 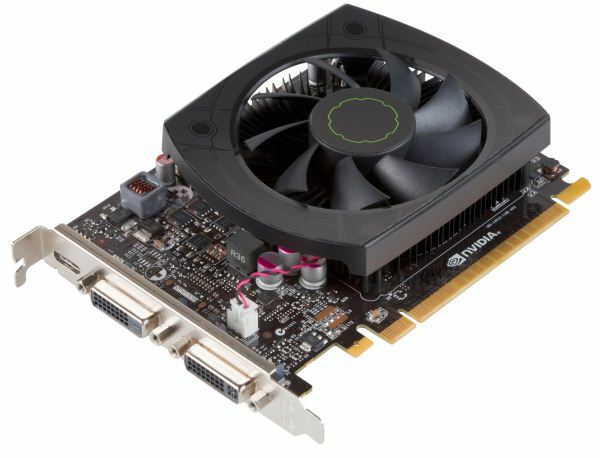 The GeForce GTX 560 is currently going for almost exactly $150, making it direct competition for the GTX 650 Ti. The 560 cannot match the GTX 650 Ti’s power consumption, but thanks to its ROP performance and memory bandwidth it’s a potent competitor for rendering performance. Meanwhile the Radeon competition will be the tag-team of the 7770 and the 7850. The 7770 is not nearly as powerful as the GTX 650 Ti, but with prices at-or-below $119 it significantly undercuts the GTX 650 Ti. Meanwhile the Pitcairn based 7850 1GB can more than give the GTX 650 Ti a run for its money, but is priced on average $20 higher at $169, and as the 1GB version is a bit of a niche product for AMD the selection the card selection won’t be as great. To sweeten the deal NVIDIA has a new game bundle promotion starting up for the GTX 650 Ti. Retailers will be bundling vouchers for Assassin’s Creed III with GTX 650 Ti cards in North America and in Europe. Unreleased games tend to be good deals value-wise, but in the case of Assassin’s Creed III this also means waiting nearly 2 months for the PC version of the game to ship. On second glance, the AC3 bundle makes the $150 MSRP palatable. While I agree a straight MSRP or $20 MIR at the $130 price point would have been more preferable for many, a bonafide AAA title like Assassin's Creed 3 prior to release is suitable currency. Market value for the game code is at least $20-30 (going by historic FS/Ebay prices of similar AAA title Steam codes) and up to $50-60 for anyone who was going to buy the game at release anyways. Ok and what happens after you beat AC3? You get a card that tanks in GPU demanding games. 7850's minimum frames rates are nearly as high as average framerates in games like Crysis 1/2, Skyrim, Witcher 2. You buy a GPU to play 100s of games not 1 game. NV bundled a game on purpose so people would use this argument that well the card is $150 but you get a $50 with it. That's marketing right there. It's still a $150-170 card (if we include after-market versions) that has far slower performance than $160-190 competitor. "Ok and what happens after you beat AC3? You get a card that tanks in GPU demanding games." You still have a card that is $30-$50 cheaper than its MSRP because of the bundled AC3, so while it may not have been worthwhile at $150-$170, it would certainly justify its $120-$140 pricetag. Whether you care to admit it or not, AC3 is a valid form of currency as by definition, currency is simply a medium for exchange. We're not talking about games nobody cares about here (See: Gaming Evolved titles), we're talking about some of the most anticipated games of the year on any platform with BL2 and AC3, bundled PRIOR to release while they are still relevant. The 7770 is bundled with Nexuiz....seriously why even bother mentioning it? What would you value Nexuiz at? $5? $10? Sleeping Dogs with the higher-end AMD cards is decent, still not as strong as Nvidia's BL2 promo, but yeah we are talking about AC3 here which will undoubtedly be a top 5 title for this holiday season. I don't know about you, but I am quite unsure that nobody cares about Far Cry 3, Medal of Honor: Warfighter, Hitman: Absolution, Sleeping Dogs, DiRT 3, Dragon Age 2, Saints Row The Third, the Tomb Raider remake or (especially) Bioshock Infinite. I know I do. I would actually pay full retail price for BL2 and AC3 and did actually have BL2 pre-ordered prior to Nvidia's promo. All the games you listed for Gaming Evolved I would pass on at launch or wait until they were $10 or less in a Steam sale. That's not to say they are bad titles and some may certainly feel differently, but to me and I'm sure many others, they do not carry the same value or currency as the last few games offered by Nvidia. "I would actually pay full retail price for BL2 and AC3 and did actually have BL2 pre-ordered prior to Nvidia's promo." Because video game tastes are a direct function of demand. I'm not just referring to my own video game taste, I'm making the point that AC3 is going to appeal to far more gamer's video game tastes which equates to higher demand for it at launch, and by extension, it's buy and sell price and demand will be much higher than any Gaming Evolved titles bundled with AMD cards. Dirt3 is an amd promo bundle game, and my amd total fanboy buddy just said tonight he hates it because after you install it in order to get the real game you have to go buying all their packs and upgrades spending a buttload of money so it's nothing but crap.